It’s one of the classics of our time – Bonus Keno – giving you that big money Las Vegas lottery style thrill. 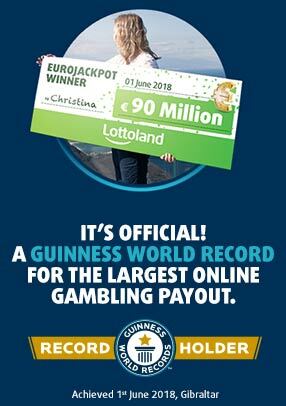 Featuring some truly massive money prizes. 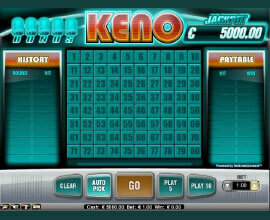 Bonus Keno delivers one of everyone’s favourite casino classics with a unique and exciting twist. Collect bonus jokers to win yourself an extra round of picks on the grid, or land the random numbers in a J pattern to bag a jackpot prize. This fast-paced and automated take on the lottery-style big money game will keep you on the edge of your seat with every play. Prizes paid for 3 matches or more on the grid. Bonus Keno pays you out prizes for matching between 3 and 10 numbers on the grid, with the chance to win bonus prizes. Use the LEVEL function to select your bet size. Before the game starts either pick your numbers manually or use the AUTO-PICK function to randomly select numbers on the grid. Remove all numbers from the grid with the CLEAR function. Commence your game with the GO button. During every game round you have a chance to hit a bonus joker. Collect five bonus jokers over the course of your game-play session and this will trigger one complete bonus game where you can win all the Bonus Keno prizes. Land in a J symbol anywhere on the grid with the randomly drawn numbers and you’ll win the Bonus Keno progressive jackpot. The larger your stake the bigger the percentage of this money you’ll win – ranging from 20% - 100% for 1 to 5 coins respectively.